This has been circulating the internet and a friend sent it to me. I don't know if it's photoshopped or real, but it sent me into absolute peals of laughter. The caption that accompanied the photo read, "College kids -- ya gotta love 'em! Obama never saw it coming... but boy was he mad after it happened. 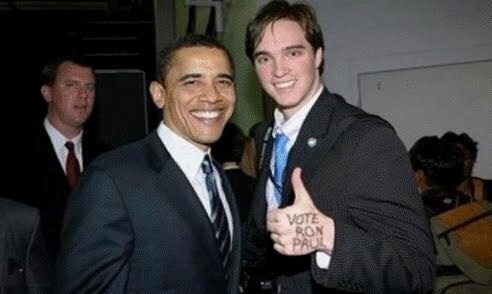 It is now rumored that Obama has everyone's hands checked before taking pictures with them." That is Truly a fantastic photo! That is an awesome photo. Real or not, AWESOME! False, as Anonymous reported. I didn't think it was funny, particularly. He is our elected President and Commander in Chief. The office deserves our respect. No one "deserves" our respect. They have to EARN it. If we found that Obama was a -- God forbid -- child molester or a mass murderer such as Idi Amin, would you still respect him? I think not. I would love to respect our current president, but I have a very long list of promises he made of things he said he would and wouldn't do, and so far he's broken every one of them! Sorry, I have no respect for anyone, not even our president, who doesn't keep his promises! 3) Put regualtions back on Wall Street after Bush lifted them causing 2008 crash. 4) Ended "Don't ask, don't tell"
5) Created stimulus for out of work people like myself. 7) College students can be on parents insurance, no pre-conditions. 8) Closed "do-nut" hole for seniors. 9) Arranged stimulus for some underwater home buyers. 10) Extended unemployment benefits that have actually helped the economy and saved people from the street. you have to give respect to receive respect. president does not mean king, and obama has proven he is not worthy of respect. I LOVE IT and I'm spreading the news! Where is your sense of humor Sandy? Even if he's your elected president doesn't make it less funny. BTW Snopes, shmokes, there will always be someone saying: "it never happened" "it's not what it looks like" Bawwwhhh, I don't care it's still funny. Don't put too much trust in Snopes. That organization has proved to be more "politically correct" than factually correct on several occasions in the past. It's become very apparent to me that it is pro-liberal-progressive and therefore not to be trusted. I can respect the office of the Commander in Chief as we the people elected him or her. I will not allow my children to call the current standing president ugly names. We refer to him as President Obama, never simply Obama. In this democratic nation, majority rules; he was elected by a majority vote, therefore he is President until we elect someone else. I work in Wisconsin where the people have not learned this lesson and the state has spent a fortune on a recall effort to oust the legally elected governor. So much money blown that could have been used for education or roads or food for the hungry or all kinds of things. I did not vote for the current President. I expect to vote against him in the next election unless my party cannot come up with a decent opponent for him. I still support him as the elected leader of our nation. I criticize him, but I try to do so fairly and with respect, not by doctoring up a photo. Maria, I respect you for taking the high road. tells me you are a moral and righteous lady. However you are dealing with a "thug from Chicago", a quote from Willie Clinton of all people. When the pot calls the kettle black...(no pun) than you know they are spot on. Only things thugs understand is thuggery and they eat up the moral ground most walk on. We Americans need to roll up our sleeves and get to work restructuring the makeup of the members of the executive and legislative branches. Im gonna have to call this one a photoshop for the following reason. The Agents working the Secret Service detail would have seen this gents hands long before he got that close to POTUS and viewed the behavior as a indicator of potential hostility. I have a wee bit of experience in this "area". He has stayed on fucus with everything that this country has needed, moving forward as best he can against not a moderate party, but a party that has made it their sole purpose(certainly not the people)to bring him down and not cooperate with him in any way. Any progress he has made has been on his own without their help. The right complains about big government, yet they insists on being intrusive of what people are doing in their bedrooms. This attack on women's health care and gays is getting tiresome and is off focus. This president is still blaming W for anything and everything. Carter is still in a twist about being called the worst president ever and called W that very thing at a funeral ceremony, no less. There is very little respect anywhere in Washington. and none for us. I agree with you about respect, but we tend to get amnesia on how great we were doing in 2000. We were in the black and the economy was prospering. I think it was the arrogance of an undeclared farce of a war to the tune of trillions in lives and teasury (no one seemed to care about spending then) followed by the removal of all regulations on Wall Street and those who were too big to fail...to make all of it come crashing down in 2008. Superman couldn't fix this mess in 4 years when it took 8 years to create it. The GOP continues to filibuster every bill Obama brings to the floor. Politics is more important to them than finding solutions to the very problems that they created. By the way, I totally support home school teaching and give kudos to parents that can do it...but it is very difficult for couples who have to hold down two jobs just to pay the bills. A fabulous trick...saw this some time ago....very clever, to say the least!